After last week’s disappointment in Ferrara when Inter dropped two points late on against SPAL, it seemed like this would finally have been the day the Nerazzurri end their awful nine game winless run in all competitions and anything less than a win would see the home side match their worst winless run in Serie A. However, even with confidence low there wasn’t a much better opportunity to get a win with Crotone sitting 17th in the table and it being at the Stadio Giuseppe Meazza but they would be no roll over as they’re of course fighting for their lives to stay in the division. Since the Roma match, Luciano Spalletti has been flirting with the 4-3-3 holding instead of his structured 4-2-3-1. A change which hasn’t done much to change the outcome of matches thus far but a switch which offers slightly more freedom and offensiveness in the midfield going forward. Two changes were made from the agonising result last week at the hands of SPAL with João Cancelo being dropped for Brazilian, Dalbert whilst the other was a forced move since star man, Mauro Icardi picked up a muscular injury meaning Éder took his place leading the attack. Internazionale club legend, Walter Zenga took charge of the Pitagorici two months ago and since then they have picked up 7 points from 7 games which isn’t the worst considering the teams they have had to play in that period. ‘Spiderman’ as he was once known as has deployed a 4-3-3 holding similarly to his counterpart with young Italian midfielder Rolando Mandragora, who is on loan from Juventus, playing the regista role and doing a very good job might I add. The game was largely dominated by Inter in the opening minutes as expected with Crotone staying tight and compact, not giving Inter any space to attack through the middle or to create any worthy chances. This was helped with the fact Zenga instructed his wingers to drop to form a 5-man midfield when they were not in possession of the ball. Their press was also done very well, something that if they got wrong could have led to serious consequences but hats off to them that. The press here is done perfectly as every option within a realistic distance for Škriniar to pick out without turning over possession was cut off meaning the ball had to go long which gives Crotone a good chance to win back the ball whilst also letting the Inter players know that they are very capable. If they just let Inter come onto them, play it around as they would like, mentally this would give the home side the advantage and the sense that their opponents didn’t believe they could get anything from this game so a good tactical decision by the former Inter shot stopper. One common theme I noticed in the first 15 minutes was that Perišić would almost play alongside the striker to allow the width for the attack minded Dalbert to exploit, something I have been calling for as it will pin teams back and provide a bit of a spark however just like in recent weeks, Inter were too lethargic on the ball. Taking 4 or 5 touches before releasing the pass which just gifts the opposition the chance to get back into shape when moving the ball from the different phases. Whenever the away side had the ball, Inter would use a high line to close the gaps between the lines making it tough for the ball to be passed through the lines of defence forcing the relegation threatened side to move it along their backline or attempt a pass which most of the time led to nothing. In the image below, the left centre back Capuano eventually tried to get the ball to the left back, Martella but the attempted pass was intercepted by Candreva and that is due to the positional awareness or unawareness from both sides. Martella should’ve been slightly further back to help with the build-up whilst Antonio had the awareness that his man is one of the better options to receive a pass given the circumstances so he should be ready to pounce which he was. Even after the goal, Crotone stuck to their guns of staying compact and highly structured in order to not concede again and give themselves a chance later in the game. 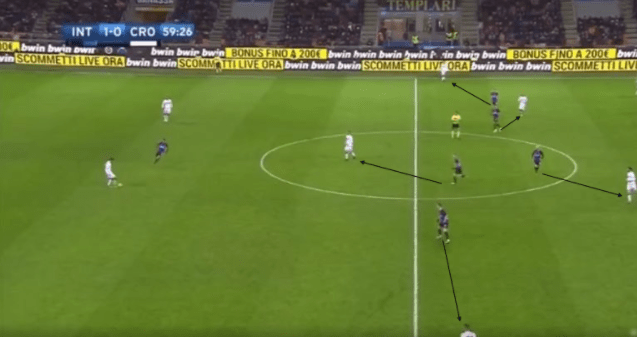 Although, at times they were willing to push more men forward but this was whenever Inter were trying to play it out from the back; something Zenga didn’t want his team to allow to happen so if/when the Nerazzurri lost the ball, Crotone already had men forward, ready to attack. This remained the case for the final 10-15 minutes of the half so overall, a simple corner separated the sides otherwise the game was completely even. Crotone continued to implement their man-for-man press which worked very effectively as Inter could not deal with not having options available or players not being capable to pick out the options when they were available and if they were able, it would have created the opportunity to counter dangerously. A risk Walter Zenga was willing to take. With Inter continuing to be very structured in their play just like when using the more defensive 4-2-3-1, it just played into the Pitagorici‘s hands as one of their main team instructions was to man mark across the field since both sides were playing a 4-3-3. If Spalletti had allowed the front 3 to interchange as well as Brozović and Vecino, it would have been more difficult to adapt as it could’ve caused confusion and it possibly would’ve led to Zenga changing to a zonal system to not cause chaos and that would’ve given the Inter players a chance to get open more often however that wasn’t the case. The build-up for the equaliser comes from a poor press, something you would expect from the team in 17th, not 4th. Crotone’s fullbacks pushed forward to provide options for the centre backs who had the ball and Inter countered that by having their widemen tucked inside ready to attack the fullback on their respective side. So, at this point there is no danger. The problem begins here, Inter are defending zonally at this point which would be part of their downfall as the ball is moved into Mandragora who slides the ball across to Capuano and this is where the error(s) occur. If Marcelo had been closer and applied pressure to Mandragora quicker, he wouldn’t have been a passing option forcing Ceccherini to go wide to the right-back, go long or go all the way back to the goalkeeper to restart the attack. So that’s the first issue, the second though is what led to the goal. Vecino (Whose positioning in recent weeks has been very questionable) decided to press Capuano once he had received the ball which is far too late, leaving his man open in the middle, as Valero now had two men to mark which is very difficult for any player. The ball was then moved across to substitute Pavlović who fired a pass into the middle as they now had the numerical advantage on that particular attack. The goal was once again a scrappy and unlucky one to concede but then again, these ‘unlucky’ goals have been a regular occurrence in this winless run so is it really unfortunate or is it due to players not having the awareness such as Vecino in this instance? I’d say the latter. In the 63rd minute, Spalletti subbed on loanee Rafinha for Candreva who again was average and, in the process, switching to a 4-1-2-1-2 narrow with Ivan moving up top next to Éder whilst the substitute would play just behind them. The change of system was the correct one as it no longer allowed Crotone to play man-for-man which led to them doing so well. An example of the new system causing problems is when D’Ambrosio snuck in behind creating a great chance for Perišić who disappointedly fired over the crossbar but a positive move. Since the formation change, inter dominated possession of the ball but weren’t able to create any clear-cut chances largely due to two things. One, being far too slow on the ball and two, not showing their quality in the final third to break this very deep and compact block. In the image below for example, if Borja Valero had the vision to find Brozović who was free at the back post, Inter may have found a winner in this game. Young French forward Yann Karamoh took the place of the Croatian #77 as Inter reverted back to a 4-3-3 but with both wingers playing a lot closer to the striker allowing the fullbacks to attack. Inter maintained the pressure for the rest of the match with the best chances falling to Ivan who is terribly out of form but the Nerazzurri were just unable to make anything count. Tactically, I feel like Spalletti once again got it wrong. He and the team were absolutely brilliant in the first 16 fixtures however his inability to change things up when it was clear that Crotone’s system was working perfectly against ours was just awful. 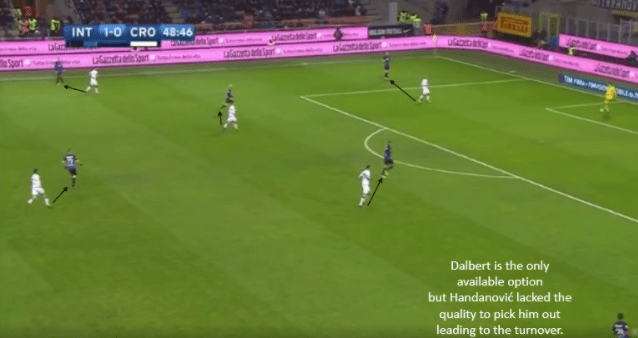 Inter have been struggling to create chances for a number of weeks now so why didn’t Spalletti instruct BOTH wingers to play in the half space with the fullbacks making attacking runs? Also, I would have played Cancelo from the start over D’Ambrosio as I feel Danilo is a player you use in the games you expect you’ll need to be more defensive. At home to Crotone, you need to win. Simple as that and in my opinion, the manager didn’t put out the best team or system to make that happen. In terms of the players, we obviously missed Mauro today with his runs and work ethic off the ball but overall, the play was simply too slow hence why it was such a struggle. I just hope Luciano changes things up next week otherwise it will be a new record of 9 games without a win in the league; something nobody wants to be associated with.